so it has crossed my mind that the butterfly knot transfers energy really well and for is low key and stays upright when rappeling much like the euro death knot. 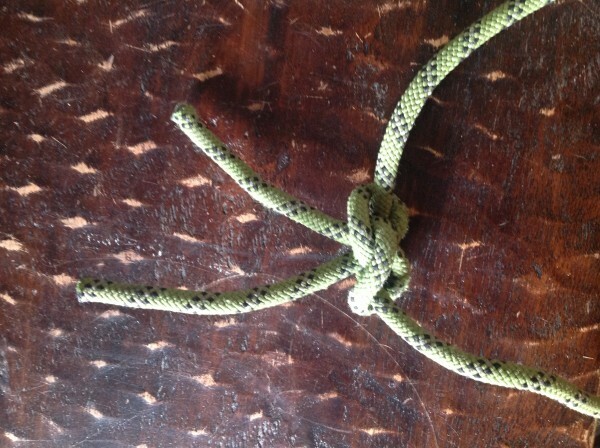 so for double rope reppels is it safe to use this knot to join 2 ropes?????? I know I am going to die but has anyone used this??? Dunno, but I wouldn't do it cause I don't like having to remember how to tie too many different knots. Also, people have been rapping for 100+ years or whatever and no body really seems to ever have concluded the butterfly is the way to go. If the pull is bad have the last guy move the knot beyond the catchy looking edge. I think it's an issue people worry more about than an actual problem. Every rap epic I've ever had involved a caught tail, not a knot. 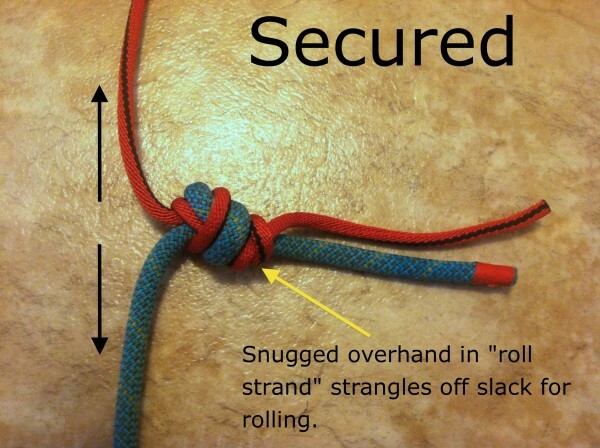 It is probably ok in terms of security; this is the knot usually recommended for tying off core shots. I would want longer tails than in the picture. But it will not roll over edges and obstructions the way the EDK and other "flat" variations do and so will be a somewhat inferior choice for featured rock. There doesn't seem to me to be any good reason to use the butterfly, however. If you want a knot that unties easily but is more stable than the EDK, the good ol' once-popular square knot backed up with a double fisherman's is the way to go. If you want unquestioned stability and aren't concerned about difficulty of untying, the double fisherman's is best. And if you want reduced pull-down resistance and less liklihood of hanging on featured rock, then the EDK is the choice. I think the EDK has pretty much won the contest, except possibly in rescue situations when high intermittent loads and/or wet ropes are involved. More likely to catch on stuff and maybe easier to come undone. Those don't sound like pluses to me. The only situation where it seems like it would work well for rappelling is when you are using a small diameter rap pull down cord and don't want the main rope to slip through the ring. In that case you end up with a loop (for a locking carabiner back to the main rope) and a separate knot joining the main rope and the pull-down rope. Rgold, do you have a statement about the double EDK shown above? Seems like another candidate for a winner. I almost always use an alpine butterfly to isolate a double fisherman for my fixed lines and raps. The main reason is that the doublefisherman is a bombproof connection but the butterfly allows it to never get weighted, thus everything is bomber but super easy to untie. There seem to be several options for people who don't trust the EDK (although there doesn't really seem to be any basis for this mistrust). The Double EDK pictured is very bulky, and the weight of it will tend to make the knot flop sideways and so not perform as well sliding over edges. 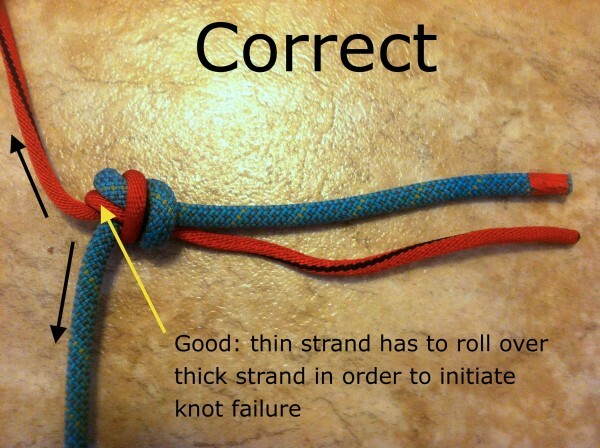 There is another version, apparently popular in the UK, in which one simply ties two overhand knots rather than one, which seems preferable to me although it has some of the same downsides as the knot pictured above. Personally, I wouldn't go anywhere near the double EDK without having seen some good testing data. The reason is that, as we have seen with the catastrophic flat figure-eight, knots that seem intuitively stable can exhibit some potentially fatal rolling capability, and if a big knot does roll, it will eat up a lot of tail along the way. If a backup is needed, for example for soaking wet ropes (in which the EDK rolls more easily) and for ropes of unequal diameter, I think a single overhand backup in one strand, pictured below for ropes of unequal diameter, is superior because the total knot is much more compact and the single backup still chokes off rolling. The catch is that you have to know which strand to tie off. easy to undo and, obviously, safe. And I did so rather frequently. probably the only two knots I tie for rapping in the last 40 years. easy to undo and, obviously, safe. I've used a sheet bend too BITD, but I think it comes with cautions and so is not "obviously" safe. It is essentially a bowline and so, at least in the climbing context if not the nautical context, is subject to loosening under intermittent load, which can happen rappelling. 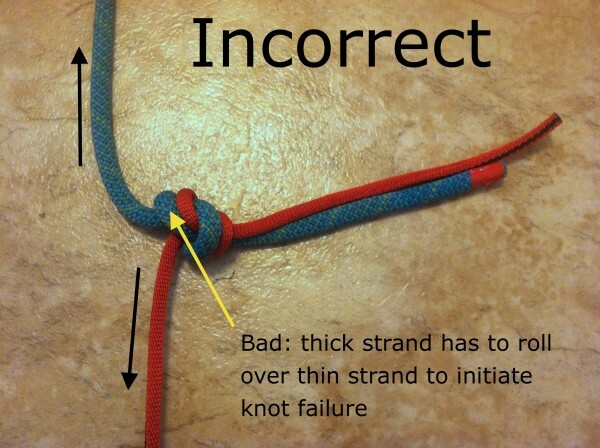 I'd use a double sheet bend and make sure to back it up with a fisherman's knot, which makes the whole configuration analogous to the square knot backed up by the fisherman's, but better adapted to different diameters. Work has been done on this and isn't too hard to find. OK I tied Malamute's new knot and have to agree that it looks better than the traditional EDK, and is easy and quick to tie. But until it's been pull tested with real climbing rope and vetted, I think I'll stick with EDK--there don't seem to be any real-world problems with a properly tied/dressed EDK, so if it ain't broke . . . I'm with Malemute - great knot! The Butterfly would work, but man oh man, is it ever hard to tie into two pieces of rope as you have shown! It would be easy to blow it, I would think. Dam by the time I got done reading that article I couldn't tell which knot he is NOW endorsing. He made a mistake earlier in writing, that is clear and he owns up to it and attempts to now clarify the situation. But he includes the original "mistake" post he wrote and by the time you finish reading you might be just as confused as I. Here we go again, round and round, how do we choose a rappel knot? Maybe 140 meter ropes are the answer. Haha, like most I hardly ever rappel if there's an alternative.